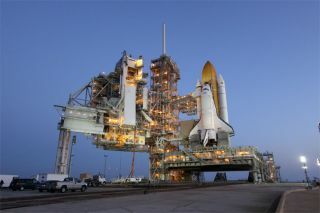 The weather is looking good for NASA?s planned Mondaylaunch of the space shuttle Discovery. The shuttle and its seven-astronaut crew have an 80percent chance of clear skies for their planned Mondayblastoff toward the International Space Station.? Liftoff is setfor 6:21 a.m. EDT (1021 GMT) from a seaside launch pad at NASA?s Kennedy SpaceCenter in Florida. ?Overall, we?re looking at a great chance of goodweather,? said shuttle weather officer Kathy Winters in a Thursday morning mission briefing. ?Itshould be a nice morning.? Only the chance of low clouds or fog pose any concern forthe upcoming launch, she added. Discovery?s planned 13-day mission is one of NASA?s fewremaining shuttle flights before the space agency retires its aging,three-orbiter fleet later this year. Only four flights remain, includingDiscovery?s upcoming STS-131 mission [see the weirdestNASA posters]. ?We had a short flyby of the pad and saw the good shipDiscovery out there, and it looks great,? mission commander Alan Poindextertold reporters earlier today after arriving at the launch site with hiscrewmates. ?We?re ready to go.? Poindexter commands a four-man,three-woman crew aiming to deliver more than 27,000 pounds (12,246kg) of supplies, cargo and new science equipment for the space station. Threespacewalks are planned to replace a large gyroscope for attitude control andinstall a spare ammonia tank, among other chores. Launching aboard Discovery with Poindexter will beshuttle pilot Jim Dutton and mission specialists Rick Mastracchio, DottieMetcalf-Lindenburger, Stephanie Wilson, Clayton Anderson and Naoko Yamazaki ?Japan?s second female astronaut ? who represents the Japan AerospaceExploration Agency. The fact that Discovery?s Monday launch will mark thisshuttle?s second-to-last mission was not lost on the astronauts. NASA plans to retireits three space shuttles in the fall, after nearly 30 years ofservice, and rely on commercial spacecraft to launch astronauts to the spacestation. ?Although one day we?ll all become part of the history ofNASA, we?re always part of its future,? Anderson said.